A solid player who was 6’2”, John Klug played junior mini-league with Glenorchy and rose through the ranks before playing with the all-conquering 1983 Glenorchy senior combination under the coaching of Garry Davidson. 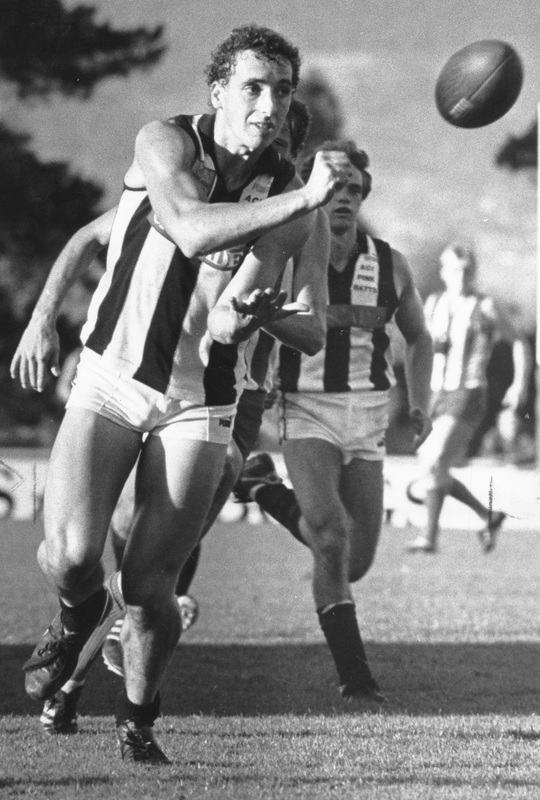 After a stellar season which included kicking four goals in a Tasmanian Football League (TFL) senior premiership and winning the club senior best and fairest at 17 years of age, he was recruited to Richmond as an 18-year-old and played two seasons for the Tigers in 1984 and 1985 without breaking through for a senior game. During this period he showed glimpses of his overall potential by playing in the Tigers under 19s grand final in 1984 and then finishing second in the reserves league goal-kicking in 1985. Upon his return to Glenorchy in 1986 and 1987 he developed into a dominant ruck-rover or centre half forward for the ultra-consistent Magpies. In the 1986 TFL grand final Klug gave arguably his most dominant performance. He was a clear best on ground as the Magpies easily mastered Sandy Bay, finishing the game with 31 disposals, 17 marks and three goals. All observers agree that John Klug was Glenorchy’s finest player on the finest day in the history of senior club football in Tasmania as Glenorchy took the seniors, reserves, U19s and U17s premierships on the one day. After another great season in 1987 in which the Magpies finished runners-up, Klug made the move to Woodville to play in the South Australian state league (SANFL). During his 53 games with the Warriors Klug developed into a highly consistent and brilliant senior footballer. He helped the club to its only senior premiership in its history in the SANFL (from 1964) and was awarded the best on ground medal in the 1988 night grand final. Additionally, in their final 1990 season, Klug was named club best and fairest and was promptly drafted to the new AFL franchise, the Adelaide Crows, at 25 years of age. Adelaide was able to select a number of more mature recruits for their inaugural season and Klug played 20 games mainly at Centre Half Forward. He was slightly built at AFL level at the time and played against much bigger opponents for most of the season. However, Klug performed well and finished eighth in Adelaide’s best and fairest, but only managed six games the following year before a serious post-operative infection to his knee curtailed his AFL career. Nonetheless, the club so valued his contribution to their inaugural campaign in the AFL that Klug was a nomination for the Adelaide Crows’ first team of the decade in 2002. Klug’s playing career at the highest level was ended prematurely by his chronic injuries, however he was able to turn to coaching with some success at Mayne in Queensland and for Glenorchy and OHA in southern Tasmania. At OHA he pulled on the boots for more than 60 games and took the club to a grand final. Klug has continued his involvement in Tasmanian state level football, serving on committees and as an assistant coach with the Lauderdale Football Club. Known for being a player with an incredible natural talent—and particularly for his monster handball, which travelled up to 50 metres when he unloaded—John Klug’s career at the highest level was restricted by injury, yet he remains one of the most talented players of recent times and has served Tasmanian football across four decades as a player, coach and administrator.